Product prices and availability are accurate as of 2019-04-19 16:53:41 EDT and are subject to change. Any price and availability information displayed on http://www.amazon.com/ at the time of purchase will apply to the purchase of this product. The ASCASO DREAM-a wink to the past and a bet to the future. 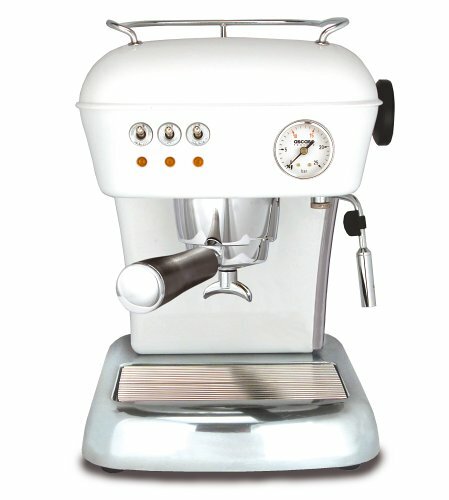 Hand assembled 16 bar pump espresso machine adaptable for use with ground coffee or coffeeservings (ESE). Brass boiler (225cc capacity) and group has external strength (does not run out if the boiler runsout of water) and has two professional brass filter holders (one for ground coffee + one for pods),1.3 liter removable water tank, functional cup warmer, water level indicator, powerful hot water and steam supply(whips milk automatically, constant stem general system with high production), quick warm up time, 900 watts, coffee thermostat at 100oC, steam thermostat at 140oC. Painted aluminum body with polished base. Made in Spain from company with rich 40 year heritage in espresso business means dependability.